An ill-assorted group of four joins together in France near the end of WWII and stops Hitler from destroying the world. This six-issue comic miniseries, published in 2002, also came out as a paperback book in 2003. The comic's exaggerated characters provide many laughs. The plot jumps around a lot in the first issues as the main characters get introduced in unexpected ways. The storyline becomes clear when Issue 3 finally reveals the group's objective, stealing an ancient necklace from Hitler. 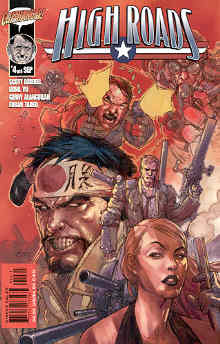 The unlikely heroes in this comic include a naïve but muscular American Army sergeant (Nic Highroad), a midget British actor who impersonates Hitler (Sir Arthur Bombridge III), a German woman who preceded Eva Braun as Hitler's mistress (Sloan Applebee), and a Japanese kamikaze pilot who decided not to complete his suicide mission (referred to as Commander Ki). Although each person failed in some way in the past, they all demonstrate their courage as they work together as a team to stop Hitler. When Sloan Applebee left Hitler as his mistress, she took the directions to Morpheus's necklace. Caesar had forged this priceless necklace in his final days as Emperor of Rome, and Hitler now has it stored at his Nazi fortress built at the North Pole. Commander Ki takes the team to the fortress in his Japanese bomber, and they discover Hitler's plan to destroy the world. He intends to detonate four atom bombs, which will melt the polar ice cap and flood the entire world. He has built a huge floating Aryan Island to escape the devastation. The four team members thwart Hitler's plans, find the precious necklace, and barely escape. The Epilogue shows them in old age at a reunion on an uncharted island in the British West Indies, and they all apparently did very well for themselves from the money obtained from pawning part of the necklace. 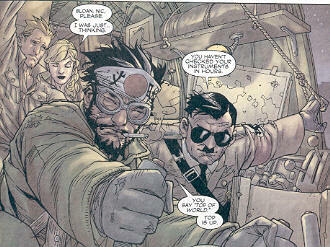 The Japanese kamikaze pilot named Ki, the last member to join the team, does not get introduced until Issue 4. At the last second before he will crash his plane into his intended target, he decides that he does not want to die. Ki decides to go live in France rather than carry out his suicide mission. When the team of four reaches Hitler's fortress at the top of the world, a female traitor of the French Resistance refers to Ki as a "failed kamikaze pilot." Ki replies, "Ki not 'failed' anything. Ki chose not to smash plane." Then Ki repays the insult by using his sword to slay the traitor and the Nazi guards around her. As might be expected in this type of fantasy comic, the portrayal of the kamikaze pilot has a few errors. Issue 4 begins on a Japanese aircraft carrier with about 100 kamikaze pilots receiving final orders before taking off. In reality, all of Japan's kamikaze planes sortied from land rather than carriers. Ki plans to crash his plane into a church, but of course in WWII the Japanese actually used kamikaze planes against ships or in some cases against other planes. Although Ki takes off from the carrier in a single-engine plane, he inexplicably has a four-engine bomber when he arrives in France. The High Roads miniseries presents some outlandish characters on a far-fetched mission. This comic's fine artwork, non-stop action, and quirky humor make this an adventure to enjoy.